A journalist who unusually started out in PR before switching to the regional press has died aged 85. Tributes have been paid to Myrtle Page, left, who worked on newspapers in Wales and East Anglia during her career. 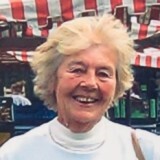 Myrtle, who had lived in Felsted since 1975, had suffered from lung and heart problems and died suddenly on holiday in Yorkshire. She had initially worked for London public relations company Pritchard Wood, where she trained as a secretary in the 1950s and became a press officer, before changing careers and joining the Abergavenny Chronicle as a sub-editor. After moving to Essex with her family, she then became a reporter for various titles including the Dunmow Broadcast, the East Anglian Daily Times, the Essex Chronicle and the Braintree and Witham Times. Myrtle also leaves sons Stuart and Keith, daughters-in-law Carol and Julia and grandsons Rowan, Jake and Ethan. A service to celebrate her life was held at the Three Counties Crematorium, Braintree on 20 November.